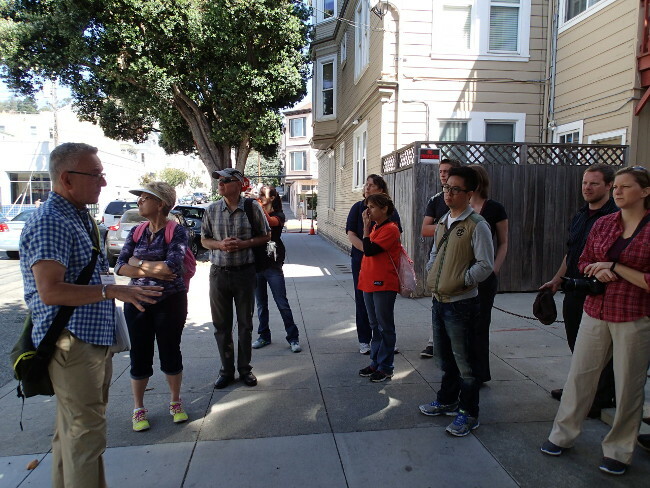 On a sunny Saturday morning, I joined another San Francisco City Guides tour, this time to the Castro Village. (I did Chinatown with them last week.) 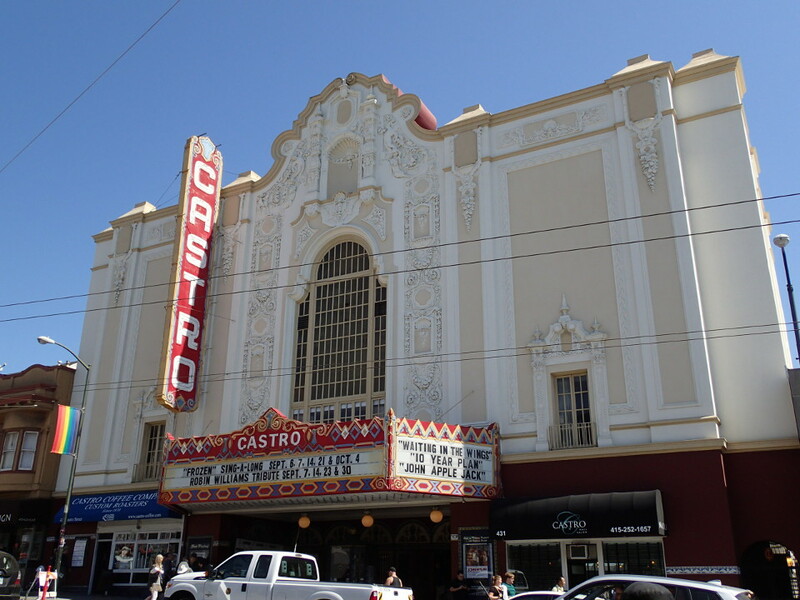 The Castro Village was one of the first gay neighbourhoods in the United States, starting in the 1960’s. Our guide, Fred Silverman (above left) has lived in in the neighbourhood for over 20 years and he knew his stuff. 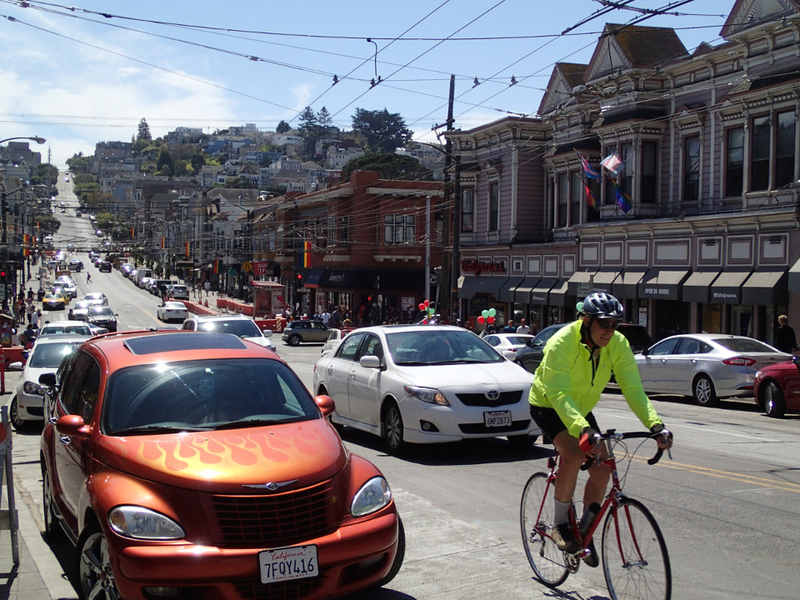 The tour started under a giant rainbow flag at the intersection of Castro Street (the main drag) and Market Street. 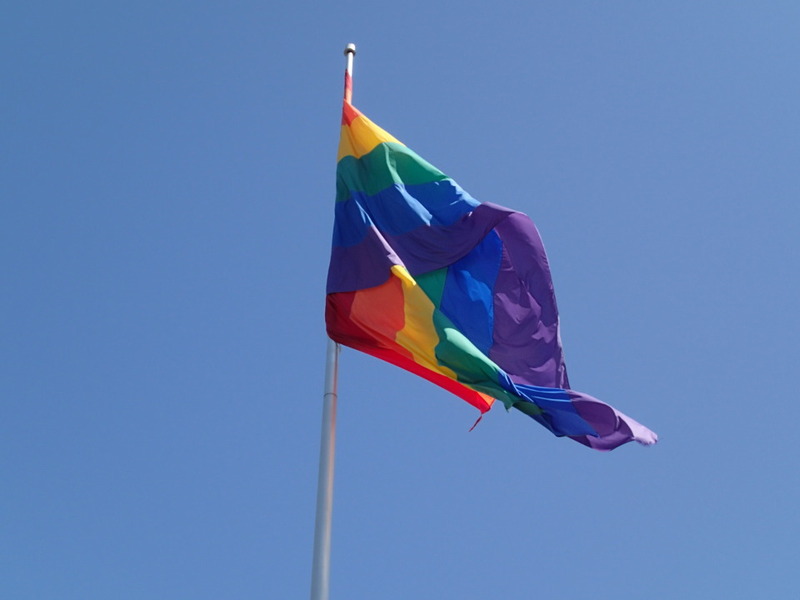 The rainbow flag was originally designed by Gilbert Baker in 1978, right here in San Francisco. Did you know that the flag originally had eight colours? For practical reasons (including the fact that the manufacturer had no pink dye), this was eventually reduced to just six. Castro street is decorated with small rainbow flags hanging down like banners. 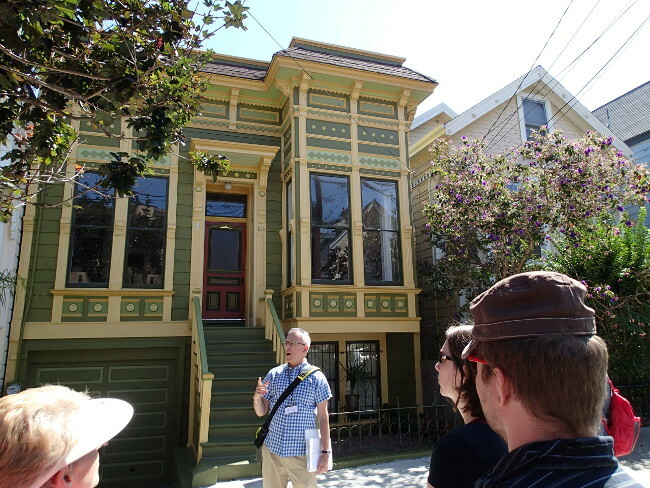 Over the course of two hours, Fred talked about the history of the area, its architecture, and of course the story of Harvey Milk, one of its most prominent citizens, whose life story is inextricably linked to that of the Castro (and the subject of the movie “Milk” with Sean Penn). 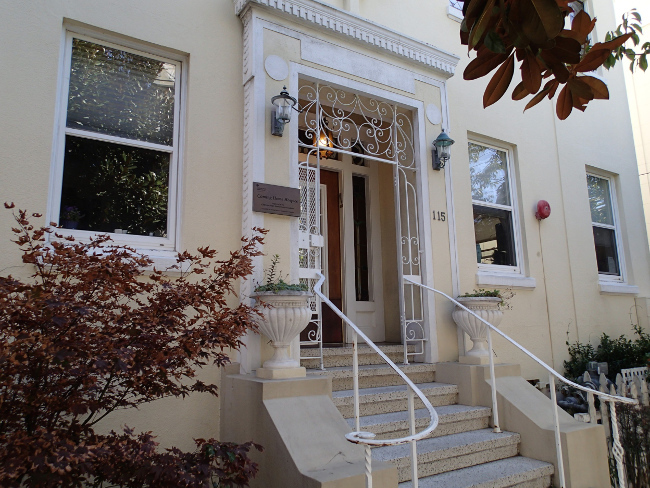 This area only became a neighbourhood of San Francisco when it was linked to downtown by public transit in 1887. From that point on, Victorian and Edwardian houses were built and many people of Scandinavian and German descent moved in. They were followed by working class Irish people in the 1930’s. However, as those people got better jobs and relocated to more affluent areas, the Castro neighbourhood was gradually abandoned and left in a semi-derelict state. 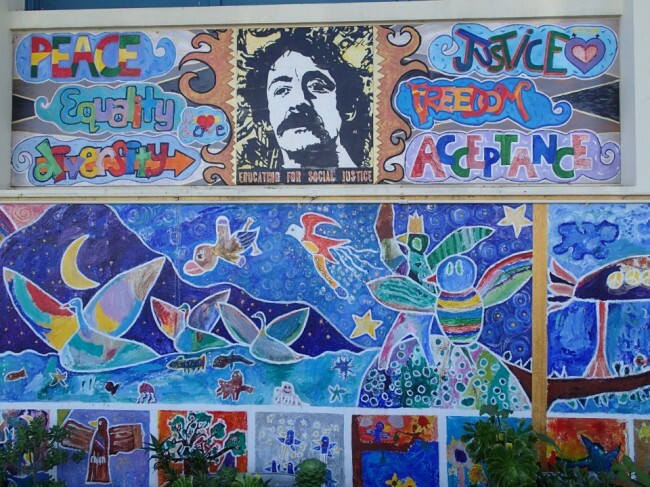 Eventually, by the mid-sixties, many gay people started moving in, some coming from the hippie Haight-Ashbury neighbourhood to the northwest. Harvey Milk moved here from New York City in 1972 and ran for municipal office three times. He became the first openly gay person to be elected to public office in California when he finally won a seat on the San Francisco Board of Supervisors in 1977, less than a year before he was assassinated. The original Victorian homes, which had been spared by the 1906 fire, could be bought for $30000 to $40000 back then, or were available for low rents. Now they go for one to two millions! The Castro grew during the 60’s and 70’s, before being hit hard by the AIDS crisis in the early 80s. 15000 to 20000 people from the neighbourhood died over two decades, before proper meds were developed. 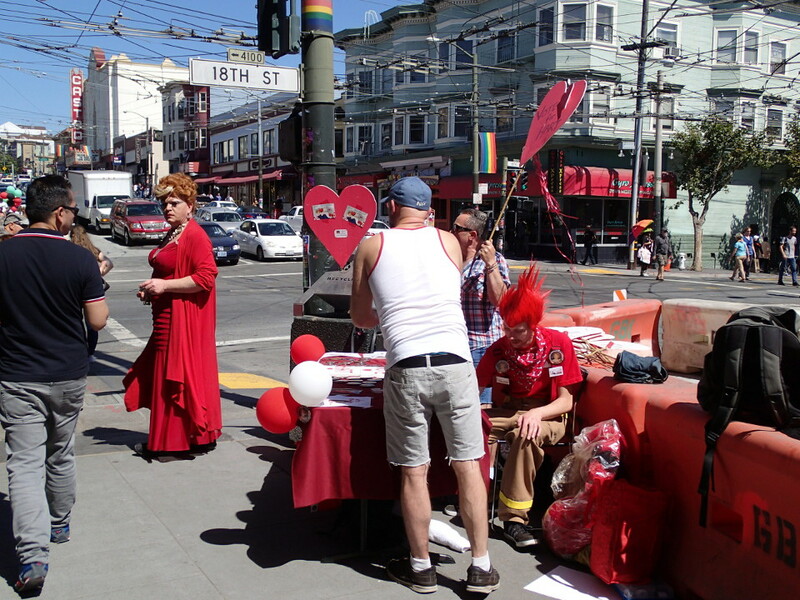 San Francisco is the city with the largest percentage of gays in the US (15.4%). This can be partly attributed to the fact that thousands of gay men were dishonourably discharged by the US military in San Francisco during World War II, due to their sexuality. 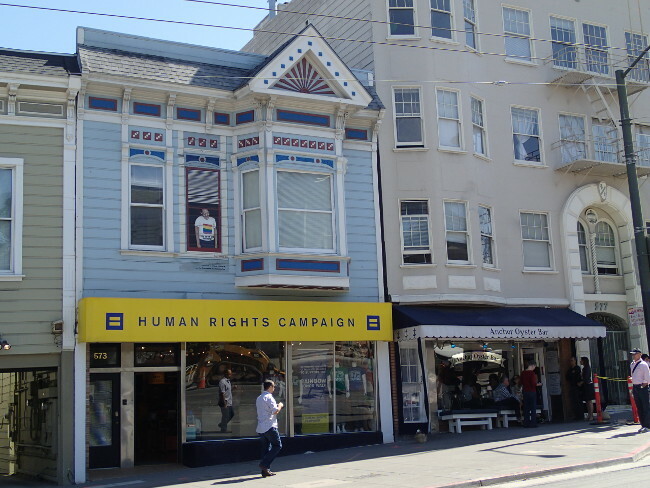 On Castro Street, Fred pointed out a few notable buildings, including the Mission-style Castro Theatre (home to film festivals and repertory cinema) and the small shop where Harvey Milk once had his camera store. The tour ended in the Pink Triangle Park and Memorial, created in remembrance of the LGBT victims of the Nazi Regime. The pink triangle was the badge identifying gay people in Nazi camps. 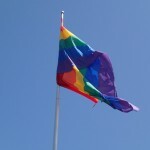 Interestingly, it later became the gay symbol of pride before the rainbow flag was introduced. After the tour I walked down 18th street to buy a gourmet sandwich at the Bi-Rite Market, a very popular grocery store featuring organic and locally produced goods. (Does any store in San Francisco sell non-organic or non-local products?) 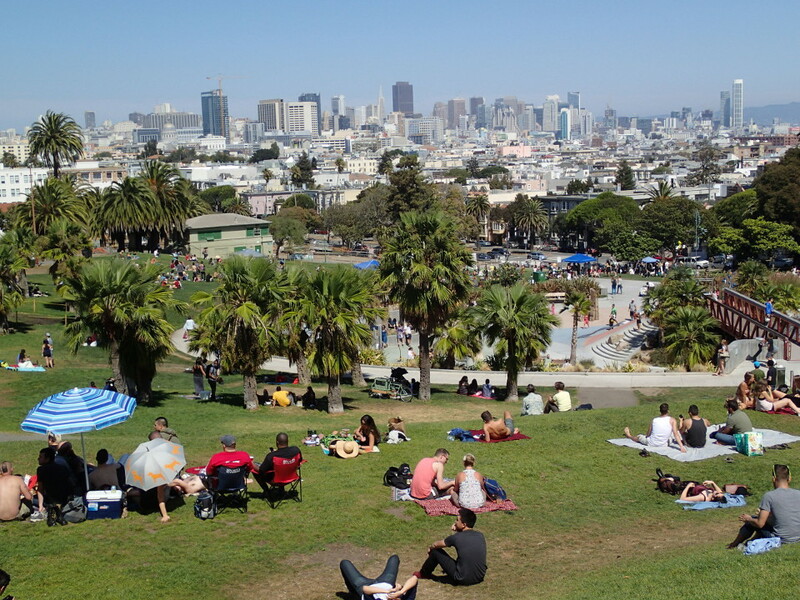 The idea was to eat it in Dolores Park, a bowl-shaped grassy park which fills up with San Franciscans on sunny week-end days. It offers sweeping views over the city and it’s also a great people watching spot. One guy was actually wearing a tail! I kid you not. He had a furry tail attached to the back of his jeans, and a huge belly. Eek! It it wasn’t for the fact that my fingers were all greasy from the sandwich, I would have snapped a picture. 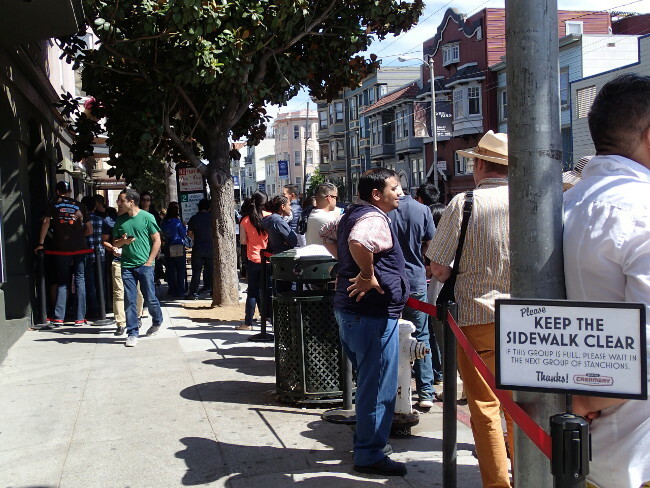 I walked past the Bi-Rite Creamery, a sister company to the grocery store mentioned above, but the line-up down the block discouraged me. This line-up seems to be a regular feature because they even have placards and ribbons funnelling the human traffic. Other than my own two feet, I’ve been using the public transit (MUNI) to move around the city. After lunch Saturday, I got back home on bus #22 from 16th street. That seemed to take forever. Given the constant hills, buses here do not move very fast. A regular announcement reminds passengers to “Please hold on” as the rides are anything but smooth. Beside English, the announcements are often made in Chinese and Spanish as well, depending on which areas the bus travels through. This morning, I sat next to a guy with a pet parrot perched on his finger! Although you’re just as likely to find yourself sitting near a huge guy with body odour. The quaint streetcars San Francisco is famous for command a large premium: $6 for one ride (versus $2.25 for the regular buses) making them more a tourist attraction than a mode of transportation. There is also a subway (underground train) but it seems to link downtown to the areas south and west. I’m in the north, so buses it is for me. Fortunately, to get to the airport, or to the cities of the East Bay such as Oakland and Berkeley, there is BART. The Bay Area Rapid Transit consists of five heavy-rail train lines that merge and stop at a few stations within the city itself (where they travel underground). I’m in San Francisco for another eight days, and the best is still to come! Stay tuned.